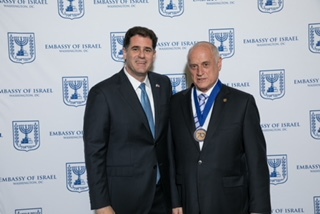 Conference of Presidents honored at a 70th-anniversary celebration at the Israeli Embassy in Washington. The Conference of Presidents was designated to receive a 70th-anniversary award recognizing the contribution of American Jewish organizations to Israel, the US Israel relationship, and strengthening of ties between the peoples of the two countries. Among the 70 honored were those who assisted Israel from its earliest years until the present day. Vice President Pence joined the commemorative event in celebration of Israel’s independence. The ceremony was held at Andrew Mellon Auditorium in Washington DC.